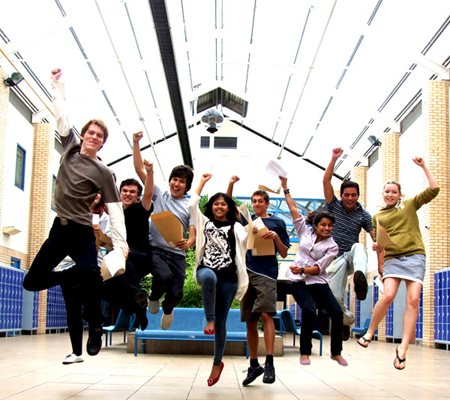 A-Levels: Did they get easier? A multi-choice. August 18, 2012 4:40 pm / 10 Comments on A-Levels: Did they get easier? A multi-choice. Hazy days have passed since A-level results so it doesn’t feel ghoulish to gnaw on a few mouldy bones and see what kind of soup we can make from the stock. Results day has visited, eaten the scones and fled, and like an enormous Sorting Hat for attractive, spring-heeled Cotswolds dryads (‘A lawyer you shall be!’ ‘A civil servant!’ ‘Ah, alas you shall be an educational blogger’) destinies have been ordained or ossified to the rustle of Manilla envelopes. YOU MAY SCOFF. But this is a theory that has been shuffling around for a while, looking embarrassed to be at the party. Some have said that children have actually become brainier since the war. You may be familiar with the Flynn effect, the rather odd phenomena where IQ scores have been genuinely increasing year on year, for many years. It reminds me of the old pulp comic description of Superman’s home world Krypton, ‘A planet where men and women have reached near physical and mental perfection.’ Maybe that’s us; maybe, like Olympic records, the mental benchmarks are being hurdled and vaulted by successively intelligent generations? But no. All the evidence we have supports the theory that our brains haven’t changed in any significant way for many tens of thousands of decades- as we would expect from the Vatican-slow creep of evolutionary process. And the Flynn effect has levelled off in the developed countries, suggesting that other factors were behind the data- better nutrition, better schooling and so on, all benefiting the bottom end of the IQ scale and raising the average, along with greater familiarity with test-taking. Besides, species-wide change in genotype is measured with millenia, in human lifespans, not the heart beat of a few generations. We’re not yeast. No, they haven’t become smarter. Not year on year, year after year. I’ve been in this game for a decade. The kids aren’t smarter. Honestly. I refer you to my previous answer: I’ve been in the game for at decade, and I’ve worked with people who have worked for far longer. Teaching has not improved by an average 0.5% every year, without fail. It just hasn’t. Nor have schools improved by the same amount. There have been great improvements made in some aspects of British education since the war, but significant gains in the way we teach? Not a bit of it. I can barely name an initiative- or at least I can count on two hands- that has made any real difference to the way we educate children. Personalised learning, independent learning, group learning, emotional intelligence, three part lessons, WALT and WILF….almost everything has been as transformational and innovative as an antimacassar, a homoeopathic syringe of magic water spunked secretly and uselessly into the canteen mashed potato. I only have ten years’ perspective; I can say without a trace of doubt, that teaching has not improved in the last ten years. If anything, I’d say the micro-management, the Soviet levels of reduction and reification and form-filling have damaged our ability to deliver anything meaningful, but I don’t need to prove that. I just need to make the claim that it hasn’t improved. 3. There has been sorcery in the way we examine our students. When I say sorcery, I’m being kind. You’ll notice my opening quote from Glenys Stacey. She’s the HEAD OF OFQUAL. You’ll remember the scandal last April when the telegraph exposed the common practice of teacher seminars given by exam boards where ‘clues’ were given out like Easter Eggs to the content of the exams; the admission by exam salesmen that their syllabuses had ‘better’ pass rates (ie they were easier), and the whole bloody Eton mess of having competition between exam boards, which, being instruments of a market, were pressured to create survival advantages that would encourage their success. To test this hypothesis, one good approach would be, of course, to look at exam papers from thirty years ago and exam papers today. They would have shown some kind of dissolution into ease, wouldn’t they? And they do. they do. Compare maths, english, science, with their ancestors, and if you think they’re anything other than substantially easier, then I have some real estate on the Moon I’d like to offer you.Essay style questions have been reduced across the board; questions have been chunked into smaller fragments; multiple choice options have been accentuated. And of course, modules have been introduced, which enables greater possibility of incremental resitting. Schools are now ruthlessly judged by their data; their place on league tables. Bean counters have this odd belief that in order to be healthy, a school examination record must show incremental improvements over time, as if they were some kind of odd balance sheets. This is surely one of the most vicious misinterpretations of schooling of them all. It’s weird enough demanding infinitely expanding success in business, but at least there you have shareholders and dividends to fluff and nurse. What’s the excuse for this devilish model in schools? Whatever it is (and I suspect the answer is simply ‘Because we’re stupid and a bit greedy’), it has been the spur and goad of the metrification, and subsequent mortification, of the schools. It has reduced us from a profession to a sector. And to anyone who gets their knickers in a twist, seeing this as some kind of attack on the children or teachers, some kind of dismissal of their efforts, who think that criticising the process by which our children are graded and sorted is a simultaneous attack on the months of perspicacity and perspiration that lead up to the Manilla certificates, well, I’d ask them to explain how we are meant to proceed? Should we refuse to talk about global warming because it might disarm our infants of the belief that Santa lives at the North Pole? So, option 1,2,3. Take your pick.